Brandon Turkus February 1, 2018 Comment Now! The Infiniti brand is difficult to pin down. Its struggle to introduce a cohesive brand identity and driving character and hide Nissan underpinnings overshadows impressive interior materials and exterior aesthetics. Few premium brands have had to prove their credentials so often. 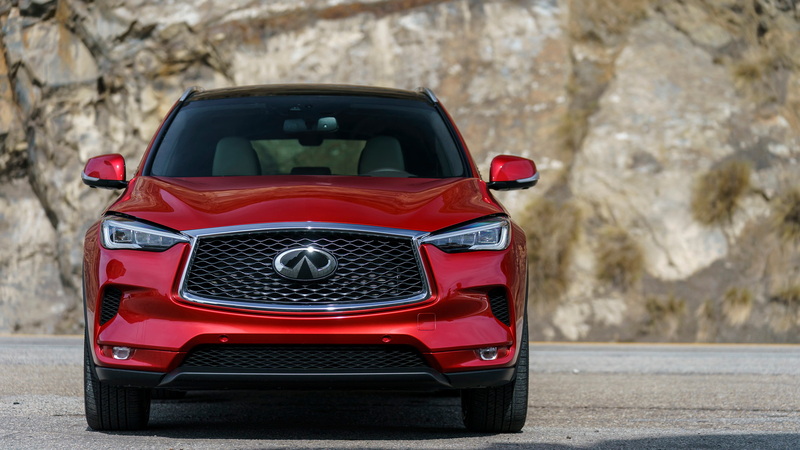 With the 2019 Infiniti QX50, the questions and concerns can stop: Infiniti has built a premium product through and through. 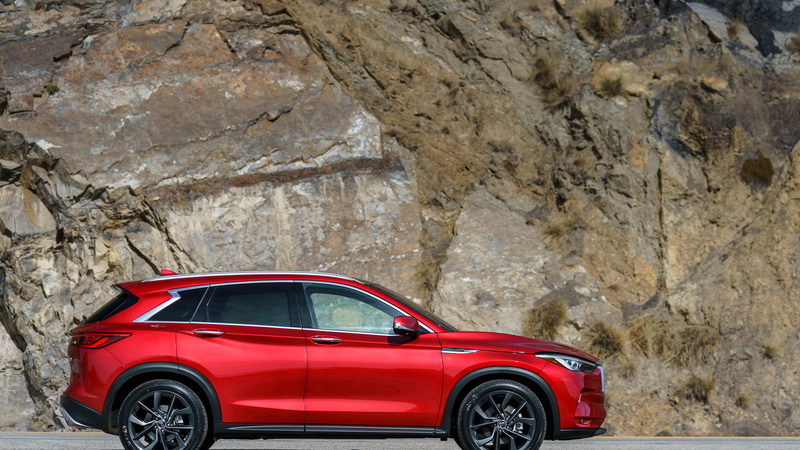 Riding on a brand-specific platform, featuring what's arguably the most advanced gas-only engine on the planet, and blessed with a class-leading cabin, the 2019 QX50 is the culmination of a journey Infiniti started at the 1989 North American International Auto Show, when it debuted as Nissan's answer to Lexus. The QX50's turbo-4 is the first engine that can vary its compression ratio on the fly. I'll spare you the gory details on how the compression ratio can jump from 8:1 to 14:1 and everywhere in between and instead suggest checking out my full deep dive with engine man Chris Day. The 2.0-liter VC-Turbo, as it's known, stacks up well on paper. At 268 horsepower, it's down on the old QX50's 325-hp 3.7-liter V-6. But the 2.0-liter gains ground quickly, with 280 pound-feet of torque to the V-6's 267 lb-ft and more accessible torque and horsepower peaks. 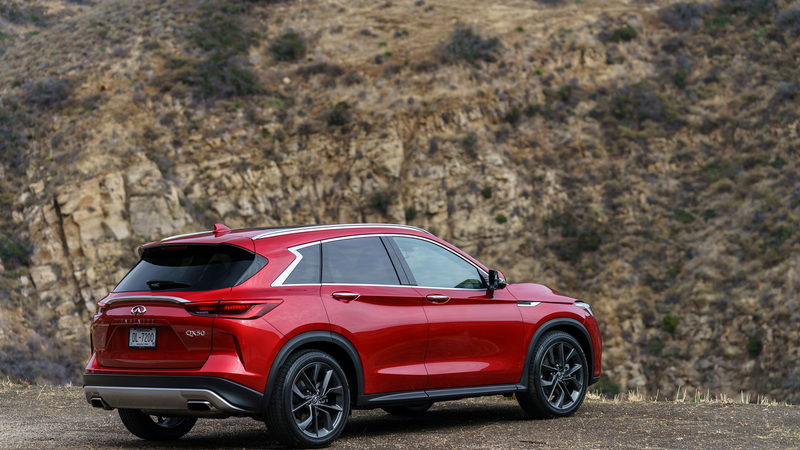 Combine that with less weight—297 pounds to the V-6's 363 pounds—and what Infiniti thinks will be a 27-percent improvement in combined mileage, and the VC-Turbo more than makes up for its horsepower deficit. Torque is impressive at low rpm, which is where the QX50 will spend most of its time operating, but it's hard to ignore the missing 57 horsepower from last year's model. The 2.0-liter lacks the high-end punch of the V-6 it replaces, although that argument could easily fit any other V-6-to-2.0-liter swap. In the grander scheme, the new engine's performance will thrill most consumers. Whether the VC-Turbo's idiosyncrasies will be as endearing is harder to say. The main problem I encountered while testing the new engine is the occasional and sudden peakiness of its torque delivery. The throttle response of the pre-production prototypes I drove was super sharp for the class, beyond even what performance-focused crossovers like the Alfa Romeo Stelvio and Jaguar F-Pace are doing. Combine that with a lack of feedback from the pedal and it takes time to figure out how to dial in the right amount of throttle. But there could be another culprit, in the variable-compression ratio system. VCR is quick to respond by design, as engineer Chris Day told me a week after the QX50's 2017 Los Angeles auto show debut. "The (VCR) mechanism itself isn't the slowest thing," Day said in December. In other words, it takes more time for stuff like the turbocharger to spool than for the engine to adjust its compression ratio. The sudden surges in torque could be an overly eager variable-compression system responding to an overly sensitive throttle and calling up the full-bore 8:1 ratio when a more balanced 11:1 ratio could do. But the 2.0-liter's behavior is difficult to pin solely on the VCR system, which fluctuates constantly but is invisible in every other circumstance. You don't feel it working. Aside from the available gauge in the instrument cluster's digital display, there's no audible sign that something is happening. In a Pepsi Challenge, it's impossible to pick out the VC-Turbo from any other 2.0-liter. Aside from a quirk I can't even firmly attribute to VC-Turbo, this new engine is transparent. Nearly as transparent is the transmission that works alongside the new engine. Infiniti ditched the old QX50's 7-speed automatic in favor of a continuously variable transmission. Now, stop moaning and groaning about the CVT—it's great in this car. Making yet another case for Nissan being the king of CVTs, the unit in the QX50 is quick to engage, doesn't hold revs unnecessarily, and does a fine job of simulating an 8-speed automatic in manual mode. On the steeper downhill grades in Malibu, California, where I tested the new car, neither engine nor transmission complained about engine braking. And when flipped into Sport mode, the CVT holds its "gear" without much provocation, helping keep the 2.0-liter turbo in its sweet spot. The QX50's new powertrain sounds better than the coarse, raspy 3.7-liter V-6, too. The VC-Turbo is smooth and refined, with a buzzy intake note that pleases the ears under hard throttle, and none of the V-6's harshness at high rpm. But it's freakishly quiet under light load and at freeway cruising speeds. But there's more than the standard Bose active noise cancellation contributing to this hushed character. Infiniti attached what it's calling an Active Torque Rod, a kind of active engine mount, to further reduce noise, vibration, and harshness from the engine. Combined with a new platform, the QX50 has arguably the quietest cabin of any Infiniti product. That new platform is also more rigid—there's a 23-percent improvement in torsional rigidity over the outgoing QX50. It provides more agile, competent handling. But that improvement is relative. 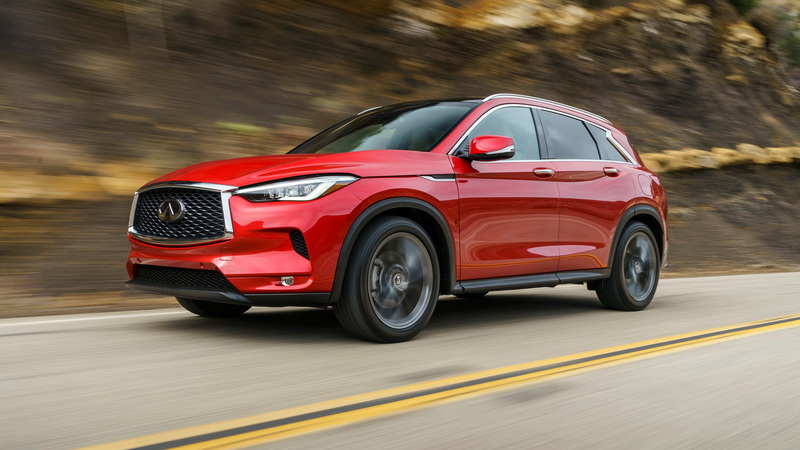 The 2019 QX50 feels more poised and better balanced around bends than its predecessor, but it has a long way to go before reaching Jaguar, BMW, or Alfa Romeo levels of roadholding and behavior. Instead, the suspension—MacPherson struts in front and a multi-link setup in back—leans toward comfort. Push the QX50 into a corner and the suspension bites casually, before the weight shifts to the outside wheels. There's a lot of roll, but it's linear and predictable, rather than sloppy. This behavior is fine for a family crossover and should satisfy the vast majority of owners. But while the suspension won't win any awards for handling, it does a fantastic job of absorbing bumps and imperfections. The new QX50's cabin is one of the best in a crowded class, although there's a catch. The only vehicles available at the launch program wore the top-of-the-line Essential trim level. Of the two vehicles I drove, the first replaced the trim's standard leather seats with the Sensory Package's semi-aniline hides, while the second featured beautiful quilted stitching from the Autograph Package—both vehicles wore high-end open-pore wood and suede accents. All told, these two vehicles featured $7,500 and $9,500 in extras, respectively. That's in addition to the $6,800 jump from the base QX50 to the range-topping Essential. In other words, the pictures attached to this review are not what most QX50s will look like. But goodness, I wish they did. Interior styling, particularly on high-end trims, has been Infiniti's strong suit over the past several years, and those talents are on full display with the high-end QX50 trims. The leather looks and feels fantastic, and with the Autograph Package's coarse diamond-stitched pattern, it's easy to forget this is a $50,000-ish compact crossover. Likewise, the wood trim looks far more expensive than the price tag would indicate, and the blue suede is just quirky enough. Ignore the upholstery and trim, though, and the rest of the QX50's cabin comes together well. Infiniti is adopting the same high-density-foam seats that Nissan has been using for years, and the effect on behind-the-wheel comfort in the QX50 is palpable. These chairs are remarkably comfortable—it's difficult not to release an audible sigh after getting settled—offering a great range of adjustment and support. In back, space is ample, even though the seats themselves are neither as supportive nor as comfortable as the fronts. Infiniti claims best-in-class second-row legroom with 38.7 inches—its closest rival is the Lexus RX with 38 inches. The 2019 QX50 is the first member of the Infiniti family to get Nissan's ProPilot Assist electronic driver assist system. The system blends a host of active safety features into a single suite that drivers can activate via the press of a button on the steering wheel. But the QX50 differs from its mainstream cousins by adding Infiniti's Direct Adaptive Steering system. This steer-by-wire setup is notorious among enthusiasts for sapping any sense of steering feedback from the wheel. That's a problem in a sporty Q50 or Q60, but it's easier to ignore in a luxury crossover. Because DAS is a fully computerized steering setup, it integrates better with ProPilot. On crowded SoCal freeways, ProPilot's behavior felt less invasive than Volvo's excellent Pilot Assist. Where the steering in the Volvo takes on a heavy, artificial weight with Pilot Assist engaged, the QX50's steer-by-wire system feels more natural. It's missing the force-feedback-like effect you get in the Volvo and feels more invisible because of it. That may make ProPilot less intimidating to the average consumer. The rest of Infiniti's technical implementation is less successful. The two-screen infotainment system confuses drivers and breaks up the clean looks of what's otherwise a very attractive cabin. And it's worth noting that Infiniti still doesn't bundle Apple CarPlay or Android Auto compatibility with the system. There's an available head-up display, but if you like your sunglasses polarized, as I do, don't plan on getting much use out of it. 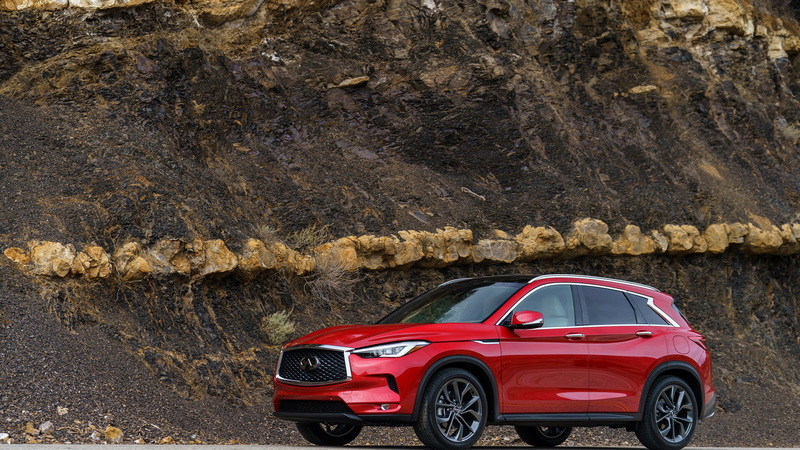 Prices for the 2019 Infiniti QX50 start at $37,545 (including a mandatory $995 destination charge) for the base Pure trim. My test models both wore the range-topping $44,345 Essence trim, and then added an extra $1,800 for all-wheel drive. But it's simple to elevate the price far beyond that—while the QX50 Pure doesn't offer any optional packages and the only box to tick on the mid-grade Luxe is for heated front seats, the Essence offers six separate packages. Grab the $2,000 ProActive Package (the entire ProPilot Assist suite, Direct Adaptive Steering, blind-spot monitors, lane-departure warning, automatic high beams, and a head-up display), the $7,500 Sensory Package (20-inch alloys, the lovely material upgrades, ventilated front seats, active front lighting, a 16-speaker Bose audio system, and a heated tilt/telescopic steering wheel), and the $2,000 Autograph Package (white quilted leather upholstery with brown accents and blue suede trim), and you'll be nudging past $58,000. That is undeniably a luxury vehicle's price tag, but for the first time in its history the QX50 feels worthy of it. It's not perfect—I'd really like to see a more progressive throttle, not to mention more feedback with DAS—but the QX50 is a sign of what the brand is capable of. For consumers, that's reason enough to finally take Infiniti seriously. Infiniti provided Internet Brands Automotive travel and lodging to bring you this report.